Where would you go if you were made homeless tonight? What would you do if your house was burnt out and your neighborhood destroyed? How would you live if the place you have called home all your life was suddenly plunged into the nightmare of war... or worse yet, genocide? Imagine that you are the one that is suddenly without shelter, without refuge from the lingering threat of death. Imagine that you instantly find yourself being hunted like an animal; no matter where you go, how far you run... you are pursued without mercy. Imagine being forced to watch everything and everyone you hold dear ripped away from you and but to the torch. Violently, horrifically... imagine that you have watched all of these things be destroyed... stripped from you so violently that you have no time to mourn your loss. For countless people, innocent in every way, this is reality. As your read this, as these words are typed, they are being hunted down like wild game. They are rounded up and killed, some are sent off to slaughter, but in the end their lives are ended in the most senseless acts of violence mankind has to offer. Three long years after the beginning of their nightmare the Syrian people still dream of hope. It is fading, the night is threatening to swallow them whole. And yet the Syrian resistance continues... the fight rages on with no end in sight. Their footsteps still fall in the darkness of war. They still follow a path to the ends of the earth, their killers never to far behind. In recent weeks the world has finally realized that Assad has well crossed the line they drew in the sand. As the Syrian refugees run Assad uses helicopters and jets to track them down. Death falls like rain upon the dry desert sands as blood and tears turn to mud beneath the refugees' feet. When they feel safe, when they go just beyond the sight of the vultures above, Assad uses scuds to wipe them from the face of the earth. And if they survive, Assad uses gas to poison those who remain. Soil samples smuggled out of Syria show that chemical weapons were used. This was the thin red line that Assad was supposed to stay behind. This was the supposed tipping point for the war weary West. Yet here we are once again... the Syrian refugees continue to make the trek to the edge of their world. They walk through the shadows of the abyss with the fires of hell flying upon vultures wings overhead. Their tears dot the roads and paths through which they come. And now, now that their butcher uses the one forbidden tool in his arsenal, the world abandons them. The United Nations has registered 1.35 million Syrians as refugees at the current time. With 8,000 Syrians fleeing Syria everyday that number is only going to continue to rise. It is also important to note that only a year ago that number stood at 33,000 Syrians outside their homeland as refugees. This number does not include Syrians who are internally displaced or those currently on their way out of the country. For countless decades now the Rohingya people have been a people without a homeland. The ancestral homeland they have tried to remain in has been hostile at best. People they called neighbors are now their murderers. A government that hates them continues to use them as slaves. This is only highlighted by the current conditions that they currently face... conditions that warrant being called genocide. Since the summer of 2012 the Rohingya have been facing government backed genocide. Their homes were burnt to the ground as the Rakhine Nationalities Development Party (RNDP) pumped the Arakan state full of racial propaganda. In a fluid motion the RNDP made certain that the Burmese military would establish concentration camps in which to round up the displaced Rohingya. Nasaka (Burmese border guards) were enlisted, all to voluntarily, to kill the Rohingya that tried to escape. What followed the "ethnic riots" (genocidal pogroms) of that summer was nothing short of chaos... organized mayhem. Once the Rohingya were sealed off in their own villages or rounded up into death camps the government of Myanmar set up blockades. These checkpoints were designed to keep food and water out of the Rohingya villages and camps. 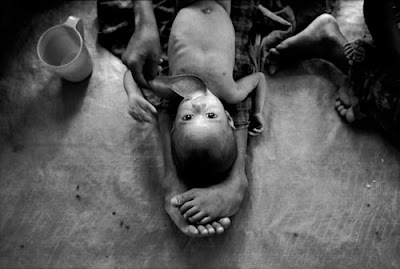 Medicine was quickly added to the list of things that the Rohingya were forbidden to have or use. It appeared that the government of Myanmar was not willing to allow the world to watch the full-fledged slaughter but was more than willing to allow the Rohingya to starve to death. Today the Rohingya that are able to escape do so by putting their lives at risk. They trust human traffickers and profiteers to get them a place on a boat destined for Malaysia or Indonesia. By handing over everything they have and abandoning everything they have ever known, the Rohingya gamble upon the unknown. The devil they can't see waiting is somehow better than the devil they currently know in Burma. Boats out of Myanmar are death traps. They are rarely equipped with the food, fuel, or water to get the overloaded vessels more than a day or two out to sea. Starvation, drowning, and slaughter are all very real possibilities for those who set out to flee Burma. And once they arrive at their destination, given they didn't perish by then, there is no certainty that they won't be sent back Myanmar. This long trek out across the unfamiliar lands and seas of Southeast Asia have been the subject of countless news articles and documentaries over the years. With each "season" the Rohingya are referred to as "boat people". With every "season" the Rohingya are abandoned by the world as country after country set them back out to sea. For the Rohingya there are no official numbers for just how many are refugees. This is mainly due to the fact that Myanmar views all Rohingya as illegal even in their homeland, the Arakan region of Burma. Thus all 800,000 estimated Rohingya within their own homeland could be considered refugees even though they have not left their homes. As for those in camps, there are 125,000 estimated Rohingya (and other Muslim minority groups) being counted as refugees. Life for the Rohingya is nearly impossible. For the Rohingya trapped in camps the coming rainy season will bring new challenges. Their camps are set up in flood plains. Once the rains start their makeshift homes could be underwater. And according to some even this was intentional, that in some way the government of Burma had planned for the coming rains and the trouble they would cause. In a matter of weeks the rains will come. Like clockwork, the rains always arrive in Burma. The long road to the edge of their world calls to the Rohingya. The devil they can't see waiting at sea calls to them with the same song of Homer's sirens. In the dark night, as the flames of hate gather all around, the Rohingya look for a way out... they seek hope in a place where there is none to be found. When you look at a picture of Korea at night there is a remarkable apparition that appears. Between the bright lights of Seoul and the illuminated border with China it will always show its face. There, in the eternal darkness of pride and self-loathing, that is where you can see the face of evil. In the darkened landscape of North Korea you can see what the ego of a twisted individual can do when left unchecked. For the peasant class of North Korea this darkness has been a cloak from under which they have never been allowed to peek. Their homeland, or a portion of it, has been transformed into the worlds largest open air prison. The lights come on when the warden says so. Food comes out when the warden says so. And their time in the yard is regulated by the warden's guards. Even the elite amongst them are subject to the whims of their sovereign leader. This insanity has led some North Koreans to risk everything on the off chance that they might escape. But unlike the Syrians, unlike the Rohingya... the North Koreans risk the lives of their families, their friends, and even their acquaintances once they take to their pathway to the edge of the world they know. One footstep down this path and there is no turning back. With one move in this direction they suddenly find themselves hunted. Their families are hunted. Their friends disappear. Yet despite all that the North Koreans risk for liberty, for hope, for freedom... there is a network that keeps the pathways open. In the darkness these warriors fight for freedom. Without firing a shot they wound the system from which they came. This is the underground railroad of North Korea. At the edge of the Korean world there is a passage to freedom. Nobody knows where it starts. Nobody dares speak of how you get there. But it is from there that gateway that the journey to freedom begins for North Koreans. Death however is forever present for the refugees of North Korea. 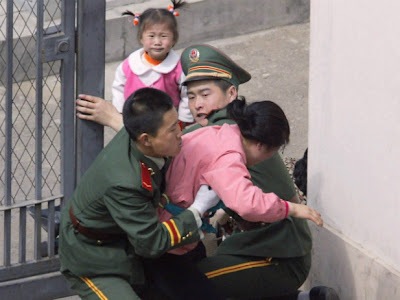 Once in China, the North Koreans are considered illegal "economic migrants". The People's Republic of China does not recognize North Koreans as refugees due to its alliance with North Korea. To admit that people would become refugees from North Korea would mean that China would have to admit that communism in North Korea is broken. And it is in this aspect of escape that death readily awaits North Koreans fleeing over the border to China. Despite agreeing to the terms that the United Nations laid down in 1951, China refuses to stop it's program of "repatriating" North Koreans to the government from which they fled. Once caught the North Koreans know what awaits them. If taken over the border and put back into North Korea the refugees face certain death, either immediate or after lengthy prison sentences carried out in work camps (death camps). At the moment there are an estimated 250,000 North Koreans hiding within China. Most are refugees still attempting to make their way to countries that do not "repatriate" them back to North Korea. Others are simply trying to live under the radar in hopes that eventually either the laws will change or the North Korean government will cease it's pursuit of them. For all 250,000 the threat of death and or capture still lingers over their heads. For North Koreans who become refugees the long pathway is filled with danger. Agents from North Korea are openly allowed to cross the border and hunt "defectors" down like animals. China proudly engages in raids to root out Korean refugees. And the local populations through which they travel hold racial bias that make them prone to turning over refugees to the authorities (with added incentive of bounties). But their footsteps continue to be heard in the darkness. The plight of the refugee is never an easy thing to imagine. It is hard for those of us in a world so different from theirs' to fully comprehend what it is like to be pursued in this way. Even at our best, with the most sincere intentions, we may never know what it means to be a refugee... a person without a home or country. Yet that should never stop us from trying to understand. It should never keep us from trying to help those in the most need of it. For some the plight of of the Syrian people may be where your heart calls you. For others it may be the Rohingya and their desperate situation. And for a few it may even be the oppressive reality of the North Koreans that calls to you. No matter where your heart is leading you, these people need your help. Their paths lead them through the darkest places on this planet. Their lives have been made almost unbearable for circumstances far beyond their control. They need your help. There are numerous organizations that are helping these very people mentioned here. Below you can find ways you too can help. But it is most important to remember that the quickest way to help is always to "scream" (search 'scream' here on Alder's Ledge to learn more).